Coyote Springs Golf Club - Coyote Springs Golf Club Nevada - A Jack Nicklaus Golf Course, the best in golf specials and packages for the Henderson, Mesquite, St. George and Las Vegas area. Welcome To Coyote Springs Golf Club! Coyote Springs is the first Las Vegas golf course in a planned series of Jack Nicklaus-designed courses that will flow throughout the Coyote Springs community. The course plays to a par 72 and ranges from 5,349 yards from the forward tees to 7,471 yards from the championship tees. Eleven lakes come into play on the golf course many consider to be one of Jack Nicklaus’ finest desert creations. Coyote Springs has one of the largest and most diverse practice facilities in the world. The current practice facility measures 22 acres and features more than 100,000 square-feet of tee area, 13 target greens for a variety of club selections, as well as a short game green for pitching, chipping and bunker practice. The practice green measures 10,000 square-feet and offers a multitude of hole locations to prepare you for your golf experience. The facility is anticipated to expand to 32 acres within the next few years. On top of our course’s amazing design we also offer the best golf specials in Las Vegas, Henderson, and Mesquite NV. Guests from neighboring Henderson, Mesquite NV and St. George golf courses will discover we truly are the best place to golf in Las Vegas and offer the best golf packages. The Coyote Springs setting has been characterized as Nature’s Cradle — a magnificent valley surrounded by majestic mountains and peaks on all four sides. To the north, south and east respectively, are the Delamar Mountains, the Arrow Mountains and Meadow Valley Mountains, each rising to an average elevation of 5,000 feet. And to the west, the Sheep Range, which reaches 9,000 feet into the sky, is snow-capped during the winter months and provides an amazing backdrop for peak season golfers. This hallmark setting consists of rolling terrain overlooking a prehistoric riverbed-the Pahranagat Wash-which bisects the Coyote Spring Valley. To the east of the wash, rolling hills transition to a natural mesa commanding excellent views of the valley and surrounding mountain ranges. West of the wash, hills give way to flatter terrain with exceptional views of the mountains. Our serene golf course will be a much needed change of pace from the busy Las Vegas Strip. 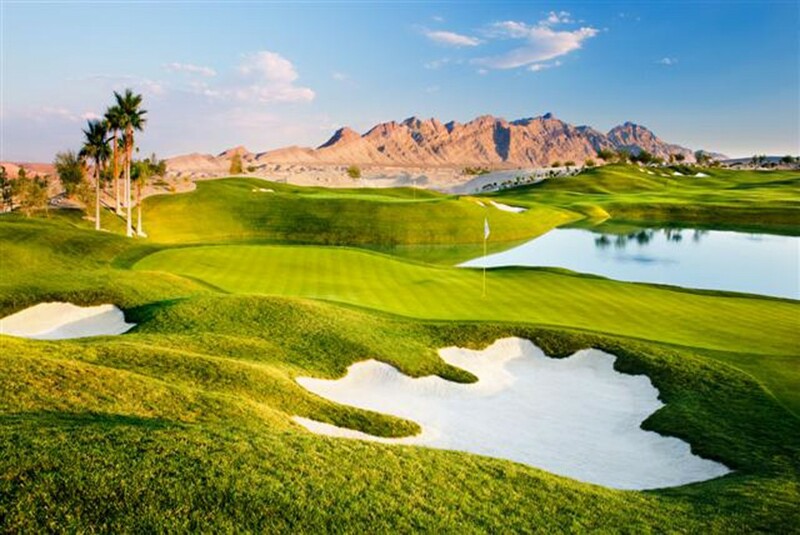 In addition to the wonderful setting and breathtaking views Coyote Springs, a Jack Nicklaus golf course, offers a golf experience unlike any other, with some of the best golf specials and packages in Las Vegas. As one of the top rated Las Vegas golf courses in the last 10 years we offer the best location to play. No matter the season it’s always game time with our amazing Nevada Resident golf specials and fantastic rates for our guests from out of state. There is no better place to golf in Las Vegas. Guests who love to golf in Henderson, Mesquite NV, or visit from neighboring St. George golf courses will feel right at home. Other Las Vegas golf courses may offer golf specials and packages, but none rival the deal you’ll receive when golfing at Coyote Springs.